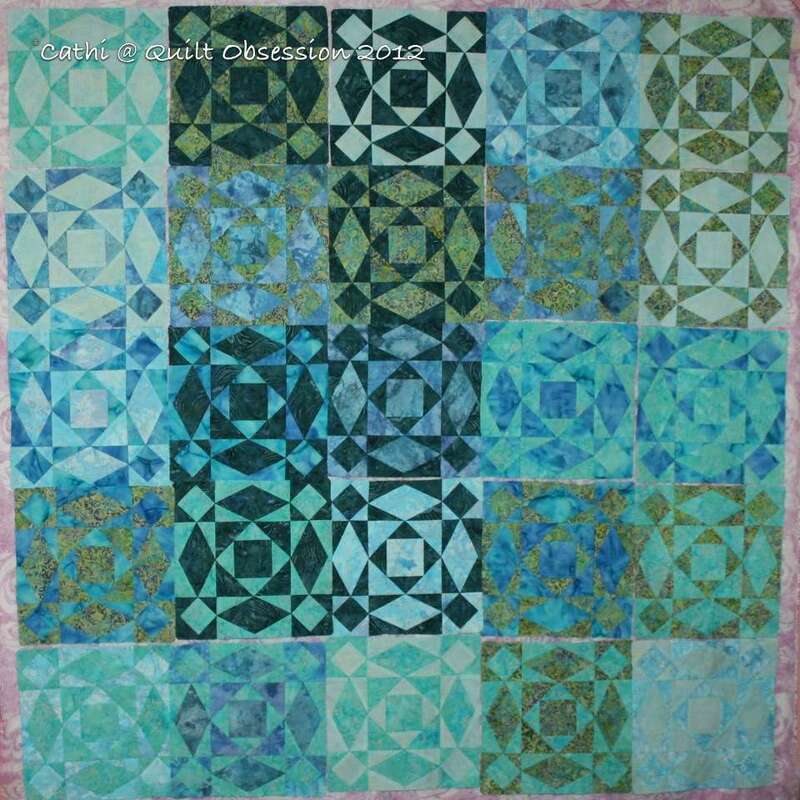 The 28 melon/arc combos have been added to centres and the remaining seven rings I needed to finish the quilt top are now made. I joined the first four of the rings to the quilt top last night but it was too late for a photo. Now I need to add three more centres, four more rings, then seven edge setting pieces and the Summer Picnic Dish quilt top will be finished! It’s nothing but lots and lots of curved piecing now – one of my favourite things and it’s coming together very quickly. I think it will be finished before the World Series even begins, perhaps even before the weekend is over. Maybe it will still be nice enough out on the roof garden on the weekend to get a photo of the completed top. That means I can then play with some more kaleidoscope stars. Or maybe I’ll work on the Pickled Ladies border. Or perhaps it will be time to get back to work on the Stormy Seas blocks. Or maybe I’ll start a new series of kaleidoscope somethings with the pottery fabric. The choices are endless. Panda successfully teleported to join Baxter and the little alien to watch baseball playoffs. Baxter in his kitty tree yesterday afternoon. Most of the leaves on the tree are still green and very, very few have fallen, even though yesterday was an incredibly windy day. yay! The end is near. Your “maybe next’ list is as long as mine…….. I can hardly wait to see the finished top! Do you do all your work by hand or do you do a combo of machine and hand? I am very new to this and should be printing my first sheets of inklingo shortly! Baxter is a very handsome boy! You’re almost there, almost time to celebrate! There sure is a lot weird stuff going on with Baxter and Panda and those aliens. Great picture of the real Baxter! Can’t wait to see the finished Picnic Top! And Panda loves that she is wearing her Texas Rangers cap for the baseball games. We do love our Rangers here. She’s also thrilled that she got some bubble gum right away, but is a bit concerned about messing up her fur and whiskers. Looks like Baxter is just ready to blow a bubble himself. And Dear Hubby was especially impressed with the Tesla Coil on the teleporting machine. Great job, Mr. Q.O.! That’s going to be so pretty! We had a very windy yesterday too…….this morning smoke is blowing in from fires not too far away. You’re lucky not to be here, Baxter! Your work is flawless as usual! I can’t wait to see the final product.